Here's an interview with the multi-talented Pat Todoroff, glassworker and weaver of sci-fi adventures! Had an different childhood: I was hit by a taxi while on a bike at the age of seven. My earliest memory is waking up in Intensive Care Unit wondering who the two people at my bedside were. Turned out they were my Mom and Step-Father. Life has been a little odd ever since. Became a Christian at twenty-one as a consequence of taking a friend's challenge to pray and ask Jesus to forgive my sins and make Himself real to me. (Man, was I surprised.) I've been involved in ministry in some capacity or another from then on, even spent three years in Nova Scotia, Canada as a missionary/church plant. I'm currently 48 years old, been married to a wonderful woman for 27 years, have three grown children and three grandchildren. I've been a self employed stained glass artist for the past 13+ years and began writing fiction during the 'economic downturn'. I'm partial to speculative fiction: Sci-Fi, Fantasy, Supernatural. And keep writing? 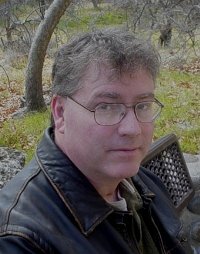 Lots of things: scenes and characters that won't stop bouncing around in my head, reading a good book, reading a lousy book, encouragement from readers/other writers, a desire to see my faith authentically represented in spec-fiction, and above all, a nagging sensation it's something I need to do. This will sound strange, but... I get a splinter in my mind - a scene, a thought, a phrase, a character - that I flesh out to see if like those sponge toys you drop in water it gets any larger. If it does, I write up an outline. If it's still pulling me on, I hammer out more material and arrange it on that skeleton. I'm trying to break the habit of editing as I write. It slows me down and potentially enamors me to material I might need to cut later. Very bad. I haven't yet mastered embracing imperfection in a succession of complete drafts. I'm working on it. In every scene, my writing mind gropes for a flow, a thread like Theseus in the Maze. I write the steps around the next corner, trying to hang on, not sever or snarl it up. The trick is to keep that continuity chapter to chapter through the entire story. Hopefully, I'm getting better at it. As a Christian, I'm supposed to say "The Bible" here, right? It's true. However, the Gospel of Luke and the Book of Isaiah have stood out over the years . Also, the writings of C.S. Lewis, Os Guinness, and Dorothy Sayers have fashioned my understanding of God's grace, redemption and human responsibility. Fiction-wise, Ray Bradbury and Lloyd Alexander both captured my imagination at an early age. (Unable to play sports, I read. A lot.) Next I recall being astonished by Mervyn Peake's 'Gormenghast' and Gene Wolfe's 'Book of the New Sun' series. Later, I have to acknowledge William Gibson, Steven Pressfield, (Gates of Fire) and Bernard Cornwell. (The Warlord Chronicles) Lately, I've enjoyed China Mieville's 'Perdido Street Station', Joe Abercrombie's 'The First Law' trilogy, Patrick Rothfuss, and Justin Cronin. I'm also a huge fan of poetry, everything from Tennyson to Wisława Szymborska, Anis Mojgani to Stanley Kunitz. I'm halfway through Mary Oliver's "A Thousand Mornings'. Yes. More Clar1ty Wars, a dark fantasy piece (feels huge) and a supernatural thriller. Thanks for the opportunity. Much appreciated.